Today marks a very special day as it was exactly 10 years ago the first commit of Apache Camel was done by its creator James Strachan. The project was created as a sub-project to Apache ActiveMQ and back then github did not exists, so its using good old subversion. 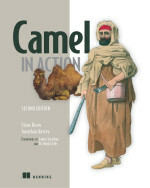 In summer 2007 the first release of Apache Camel was published, which happened on July 2nd so lets wait until the summer to celebrate it's 10 years birthday.